2000 Colorized Statehood Quarters - Set of Five | BUDK.com - Knives & Swords At The Lowest Prices! 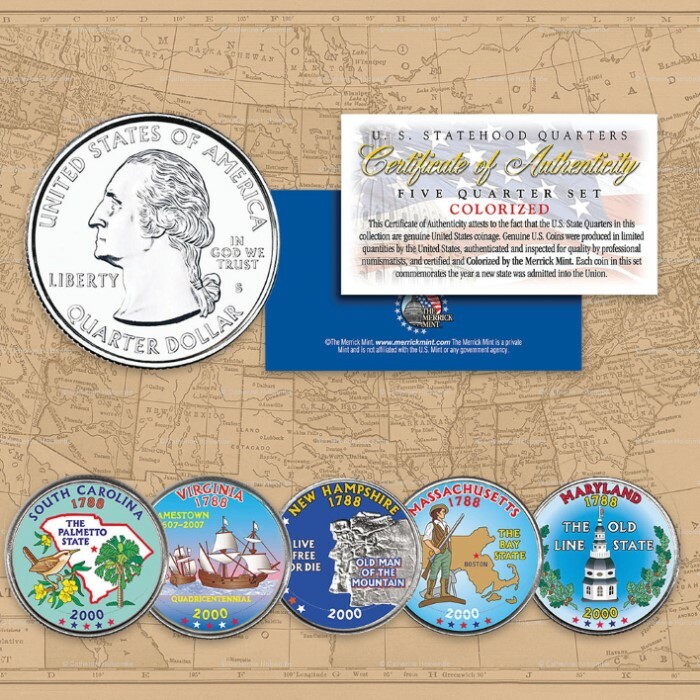 Here is your chance to own a complete set of five beautifully colorized United States 2000 Statehood Quarters featuring five states: MA, MD, SC, NH and VA. Each coin is beautifully enhanced on the reverse in permanent full-color by the Merrick Mint to highlight the original design using a unique colorizing process, which involves the application of special inks directly to the surface of a coin. The result is an everlasting colorized coin collectible of ultra-high quality that is the top in the industry. Each coin features a unique state design on the reverse and a common obverse with a portrait of George Washington. Each coin is genuine legal tender of the United States and comes in an acrylic coin holder and includes a Full Color two-sided Certificate of Authenticity. The State Quarters Program was the most popular commemorative coin program in United States history!